The "Trump Bump" hasn't showed any signs of stopping with the S&P 500 climbing higher by another 1.79% during January. Despite a market that climbed higher we still showed a slight decline in out net worth primarily due to violating the most basic law of personal finance: income > expenses. The $300 in dividends helped to soften the blow a little bit, but we really need to fix the simple problem. For the month our net worth decreased $397.60. The 2 month streak net worth increases ended with January's slight decline. That was completely due to us continuing to draw on our cash reserves. Looking forward though the cash bleed will stop now that I'm back at work. For the month our net worth decreased 0.08%. As of the end of January we have 24.4% equity in our house based on our purchase price from 2013. However, according to Zillow our house has increased in value $22.3k from our purchase price which is a nice bonus, although I keep the purchase price as the value in the net worth equations. Based on Zillow's estimate the equity in our house is 31.4% due to the appreciation. 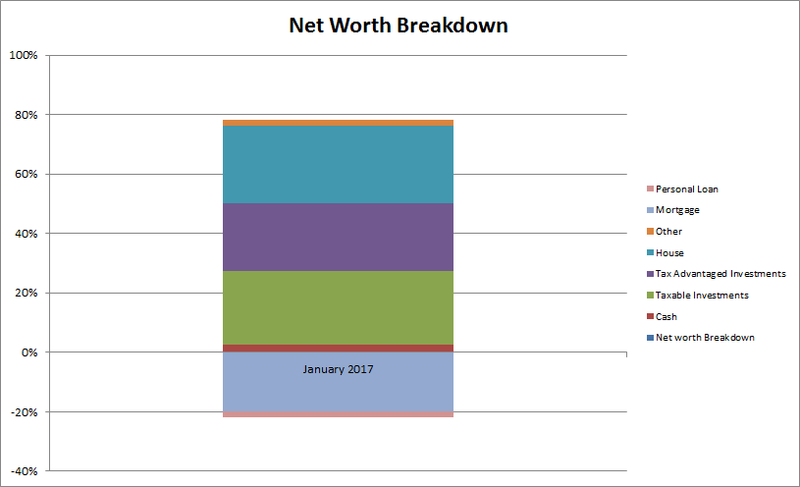 During June's update I started including a % breakdown of our net worth with each monthly update. The assets are broken down into cash, taxable investments, tax advantaged investments (401k, Traditional & Roth IRAs), house (using our purchase price) and other which covers things like our cars and various collectibles from when I was a kid. The liabilities are much simpler and fall into either the mortgage or a personal loan that we have. Although I do need to gather more information on the various medical, funeral and other debts that total around $40k to give a more accurate representation of our liabilities. Truly passive income, dividends and interest, totaled $288.61 during January which just over a $27 increase from October 2016's total of $261.28. That's a solid 10% increase quarter over quarter. *Dividends are from my taxable accounts only. Adding in the EBIT earned from blogging/writing added another $243.17 to the monthly non-day job income total. Total non-day job income for January came to $531.78. I've still yet to get a goals post out for 2017, but I've had an idea in my head for where I'd like to see our dividends/interest/writing income end up for 2017. For all of 2016 we generated around $9.4k which is solid additional income. I'd like to see us hit at least $10k for 2017 with a stretch goal being $11k. We're currently 5.3% of the way towards the $10k mark. How did your net worth fare in January? Did you get 2017 off to a good start? 0.08% is more of a rounding error, than a decline :) Congrats on the 10% dividend growth for the quarter. I hope the new job is going well for you. Yeah the 0.08% decline is essentially negligible by itself. But since I can look at the big picture and see what contributed to the change, i.e. income vs expenses vs investment changes, it's a disappointing result. Our investments were up during January, like I'm sure just about everyone's was, but our net worth declined because our expenses were more than income. 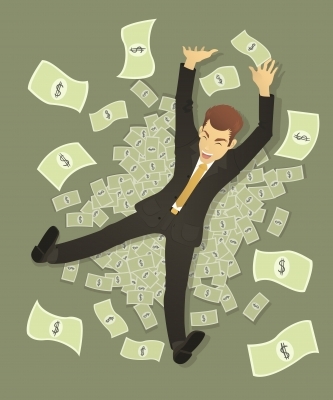 Luckily now that we've got a second income rolling in again that will be changing so the cash drawdowns won't be happening assuming I keep up with steady work and we can actually start to make progress on our debts to boost our net worth.